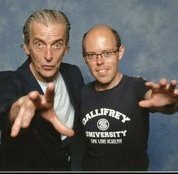 Peter Capaldi Fan had the most liked content! Just give me the chocolate and no-one gets hurt! It takes a very brave person to come between a woman and chocolate! * *How many people did you trample over to get it? I was too polite to mention this dumbing down of your gender. For one awful moment I thought you'd spelt a couple of words wrongly! Then I realised you had! I've never thought of this. Well noticed. If I have one criticism of Moffat it is that his more complex stories and arcs do tend to lead to more plot holes than RTD had. Spoiler Alert Don't post spoilers! Diamond Pass John Barrowman Charles Dance William Shatner Photo Robert Carlyle Jason Isaacs Christopher Eccleston Jenna Coleman Hugh Quarshie Peter Purves Auto Jenna Coleman - reckon this will be the hardest on vq Peter Purves Hugh Quarshie Waiting to see who else is announced but likely to add Kane Hodder. Things change for whatever reason. Some things are lost forever and can't be reclaimed. Good things can come from bad. I agree it will never be the same. But it can be the start of a new history lasting hundreds more years. And will be again. Really restores your faith in humanity with all the donations made to rebuild. Even better latest reports suggest the firefighter wasn't seriously injured. Great news especially given the sacrifices they make on a daily basis. A Christmas Carol - I really think Moffat wrote the best Christmas specials and this is definitely one of my favourites. Probably helped by the fact that this is one of my favourite Dickens novels. Second only to Great Expectations (now if Doctor Who could somehow weave that into an episode). There is humour, drama and scares. Smith is again excellent. Gambon is brilliant as Kazran as are the two actors playing the younger version. Jenkins isn't bad - but she is definitely a better singer than actor. Gillan and Darvill are surplus to requirements in this. Great production and I love the ending. I can even forgive the flying sharks. Overall - 8/10. Very sad to see a magnificent building like Notre Dame on fire. Such an iconic site on the Paris skyline. Really hope it can be restored to its former glory. He certainly had a way of dealing with unruly Cabinet Ministers!